The global C4ISR market is considered to remain fragmented in nature with several players engaged over the next few years, states a new study by Transparency Market Research. 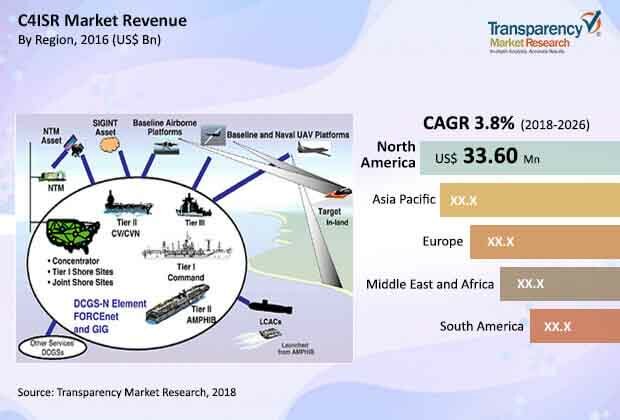 The prominent players in the market are likely to emphasize on technological developments, which are projected to support the growth of the market in the next few years. In addition to this, the rising number of collaborations, acquisitions, and mergers are expected to generate potential opportunities for the players in the near future. Also, the players are predicted to target several developing economies, thus ensuring the market growth in the near future. The key players engaged in the C4ISR market across the globe are Lockheed Martin Corporation (The U.S), Rockwell Collins, Inc. (The U.S), L-3 Communications Holdings, Inc. (The U.S), Northrop Grumman Corporation (The U.S), General Dynamics Corporation (The U.S), Elbit Systems Ltd (The U.S), Harris Corporation (France), The Raytheon Company (The U.S), and Thales Group (France). As per the research study by TMR, the global market for C4ISR is projected to reach a value of US$ 132.26 Bn by the end of 2026. The market is further anticipated to register a 3.80% CAGR between 2018 and 2026. The North America market for C4ISR is expected to account for a large share and register 4.0% CAGR between 2018 and 2026. The increasing expenditure by government organizations for research activities is expected to enhance the growth of the North America market in the next few years. Furthermore, Europe is likely to hold the second position in the market, thanks to the increasing contribution from Russia, Germany, and the U.K. The growing demand for short mission cycle time and the increasing use of geospatial intelligence are the main factors that are projected to accelerate the growth of the global C4ISR market over the next few years. The rising requirements for situational awareness in the military operations are further predicted to ensure the growth of the overall market in the next few years. In addition to this, the rise in the demand for the advanced and next-generation IP systems are further projected to support the development of the global market in the next few years. Furthermore, the rising incidence of asymmetric warfare is another major factor that is estimated to accelerate the growth of the C4ISR market in the coming years. Also, the rising research projects and the rising support from the government organizations are expected to ensure the market development in the next few years. The global C4ISR market is expected to experience a slight downfall in the growth of the market in the next few years. The high cost that are required for the development and maintenance of the C4ISR systems is expected to inhibit market growth in the near future. Moreover, the integration of C4ISR systems that are used by the different military arms so as to enhance the interoperability is likely to act as a major challenge for the market players in the near future. The rising concerns related to data processing and storage is further expected to restrict the growth in the near future. But, the rapid development of the secured networks to combat the cyber-attacks are estimated to support the growth of the overall market in the next few years. The presence of leading players and the favorable government support are projected to encourage the development of the North America C4ISR market in the near future. The rising number of terrorist attacks is another key factor estimated to support the growth of the market in the near future.